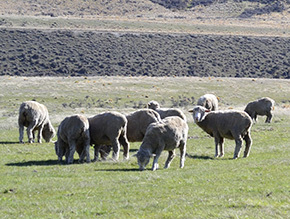 Hunger-fine aside, a healthy sheep equals high quality wool. Whether it is fibre diameter consistency, strength, staple length, crimp or colour, nutrition counts. For fine wool sheep providing minerals trace elements and vitamins to bring their base diet to very adequate is our initial agenda. Beyond this our design focus is promoting maximum immune system expression (hence health of feet) and supporting wool follicle function and process. SURE-n-SOUND was developed to supply a boost of nutrients to enhance immune function, for the health and healing of nerve tissue, cartilage and skin (including that between the hooves, and the hoof itself) and also the integrity and functioning of the mucous membranes (lungs, eyes, gut). Issues include; scald, pleurisy, pink-eye, scabby mouth, wound healing. Ideally it should be used primarily as a preventative nutritional measure - warm wet or dry dusty conditions, seed heads and or thistles, shearing.